Therefore continuous inter-religious dialogue is of paramount importance to overcoming misunderstandings amongst peoples of differing religious backgrounds. Crucifix ban (Italy) – European Court of Human Rights in Strasbourg. 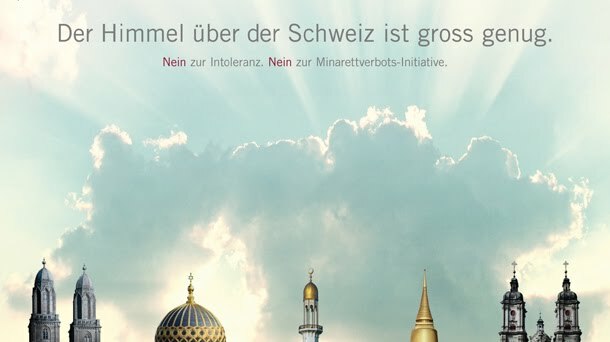 Last Sunday: Minaret ban Switzerland (57%) – over 1 Million Suisse citizens have cast their vote in the peoples referendum. From the viewpoint of human rights standards there is no doubt, that such a ban on building minarets is violating religious freedom. The point however is that during the recent years the fear of Islamist extremism has swept throughout the European continent. These concerns are very real. They don’t just go away by governments, religious leaders liberal media or rights defenders preaching to people or accusing them of intolerance or xenophobia. The outcome of this referendum has an immensely populist appeal in most European Countries. Thus, the nationalists and right -wing demagogues are having a feast in misusing this angst for their own political agendas. Ladies and gentlemen, this current crisis is definitely to be seen as a great opportunity for religious leaders to engage in serious inter-religious dialogue. For a religious person, can there be any other right more important than the freedom to worship your creator and follow his will in the way your conscience commands you to do? Ladies and gentlemen, the importance of religious freedom has been dismally neglected by political leaders! On the other hand, great human rights defenders have always regarded the freedom of faith and conscience as the “mother of human rights”. Therefore, the significance of religious freedom for creating social harmony and world peace cannot be emphasized enough. That is the very reason why true religious leaders and defenders of religious freedom always emphasize the importance of religious tolerance. Its emphasis on man’s spiritual and eternal nature and dignity as a child of God. Tolerance and religious freedom are essential prerequisites for inter-religious dialogue. Antisemitism is on the rise again. Islamophobia is spreading throughout Western – and Eastern Europe. Sectophobia – the irrational fear of so called “sects” or religious minority groups has been rising during the last 40 years in Western Europe and since the fall of the iron curtain is now also manifesting in Eastern-Europe. This is not just a mere assumption. Even governments and powerful state sponsored organizations are still supporting the agents of intolerance and discrimination (of minor religions and new religious movements). Eight (8) Family Counselling Offices with special emphasis on “Sectarian issues”. Austria’s constitutionally granted neutrality of the state in religious matters is torpedoed by these facts. Members of religious minorities from Austria and neighboring countries report numerous cases of religious discrimination in schools, communities and in their workplace. Even established NGOs with a consultative status at the UN (ECOSOC), who are running peace initiatives or relief projects in line with the UN-Millennium Development Goals reported to FOREF, that their work has been severely hampered by the interventions of the so called “sect experts”. In spite of many objections by faith communities, the Council of Europe- who is now severely condemning the Swiss minaret ban (rightly so) -has granted FECRIS (Fédération européenne des centres de recherche et d’information sur le sectarisme) consultative status in 2005. The named organization – under the banner of human rights – promotes discriminating anti-cult legislation throughout Europe. FECRIS receives substantial funding (over 90% of its annual budget- as quoted by the former SG of the organization) from the French government. The numerous protests of human rights defenders in the OSCE, COE, the UN and other Institutions have so far been in vain. Appeal to governments to stop funding prejudiced public and private organizations which promote and propagate defamatory statements about faith communities and religious organizations. Such activities infringe the principles of tolerance and integration promoted by the UN, OSCE, COE and the European Union. Appeal to religious leaders to promote tolerance toward all religious groups, regardless whether they are weak or strong, large or small. Appeal to religious leaders to invoke the great power of religion for reconciliation and peace building. After all, we are one family under God. This entry was posted in FOREF Europe, Islam, Switzerland. Bookmark the permalink. Thanks for the article. It clears my mind and helps me to formulate my personal opinion; I am left with a lot of material to think about!